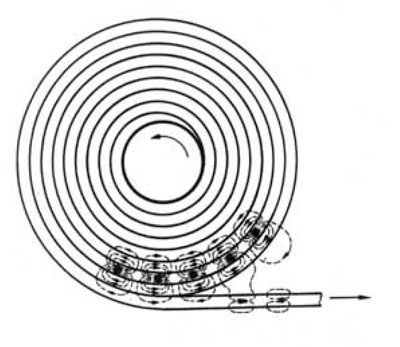 Print-through is the unintentional transfer of the information – contained in the pattern of the magnetic field on the tape – from one layer to another layer on the tape reel. It reveals itself as the pre and post echoes of the main signal. 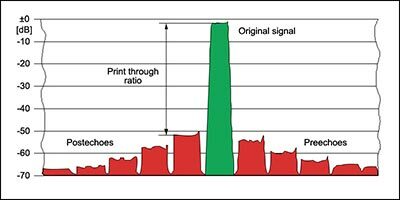 Print-through is a storage related artefact that can only be treated effectively in the analogue domain, ideally on the preparation for the transfer process. In the digital domain, this artefact cannot be fully removed! To minimize the print-through effect, wind the tape from end to end at least 3 times (but only if the condition of the tape allows it – see 1.1 Inspect for damages). Use the library wind function, if available. Use reduced winding speed/tension on tapes that show signs of or that you suspect may suffer carrier degradation during spooling. Bertram, Neil: The Print-Through Phenomenon. In: Journal of the Audio Engineering Society (JAES) Vol. 28, Nr.10, pp 690 – 705, Oct. 1980.